Two hours of music, song and dance from all Irish regions. Irish-traditional tunes, song and dance performed on authentic instruments, with Gaelic songs, ballads in English, and old-style percussive step-dance. Two hours of music, song and dance named for each of the counties of nineteenth-century Ireland, music of the island from the pre-electric age. Fifteen different tune-types are played in thirty sets of solos, duets and trios, built out to tremendous richness by uilleann pipes drones, with rhythm marked in dance steps and historic tambourine. Older song-airs and laments are set alongside local jigs, reels and hornpipes, popular dance-forms like quickstep and barndance, continental rhythms polka and mazurka, and Scottish ‘highlands’. The performers are Tiarnán Ó Duinnchinn on uilleann pipes; Gerry O’Connor, fiddle; Fintan Vallely, concert flute; Sibéal Davitt, old-style, hard-shoe step dance; and singers Karan Casey, Máire Ní Choilm, Róisín Chambers, Maurice Leyden, Stephanie Makem, and Roisín White. In Ireland, old music is regarded by its players as ‘traditional’ rather than ‘folk’, as it has had an ongoing use-value among the greater number of people over several centuries, and also because it takes in melodies and practices from a variety of aspects of cultural life on the island. It includes high-status or Court music of the old Gaelic ascendancy, recreational music of the poorer classes, some music of the Anglo Irish Ascendancy, and music of Irish-nationalism and Imperial loyalism. It also includes song and music shared with and borrowed from Scotland, England, the USA and Canada; and it has much emigrant-era song dating to the mid-1800s. Yet it is a contemporary music, with many modern-day melodies in addition to old harp tunes, ballads and sean-nós song. This album takes its music cues from the fabulous, 1832 Daniel Maclise painting Snap Apple Night, the earliest picture of group music-making in Ireland which has fiddle, flute, pipes, tambourine and dance. It presents tunes named for towns and places in each one of the thirty two counties of the island of Ireland - as it was before the present-day states were formed in 1921, a time when all social classes indulged to some extent in indigenous music. All Traditional tunes arrangement © Fintan Vallely, Gerry O’Connor & Tiarnán Ó Duinnchinn; all new tunes are © their composers - Josephine Keegan, Brendan McGlinchey, Ritchie Dwyer, Paddy Fahy, Martin Crehan, Ed Reavey, Martin Wynne, Arthur Kearney, Seán Ó Riada, Paddy O’Brien & Sean Ryan as acknowledged in the notes. This is an independent project developed and financed by the work of the artistes, without State Arts funding. It has been aided considerably by the support of concert-goers in Ireland, Europe and Australia. The contribution by Culture Ireland to certain public performances abroad is gratefully acknowledged as part of development, as are the advice and artwork by Martin Gaffney, and the initiative of Cork University Press, publishers of Companion to Irish Traditional Music. Full information on all aspects of the project on companach.ie. WHN 1801. Recorded in April, 2017 by Donal O’Connor at Red Box Studios, Belfast (redboxrecording.com); engineering and mastering by Donal O’Connor; dance recording by Brian at the Irish Traditional Music Archive, Dublin; Recording of Karan Casey by Crow Valley Music, Cork; Recording of Roisín White by John Howson, Veteran Records; produced by Compánach; sleeve-notes by Fintan Vallely; CD duplication by AxisPPM, Dublin, (axisppm.ie). Released by Whinstone, Dublin (whinstone.net) 2018. 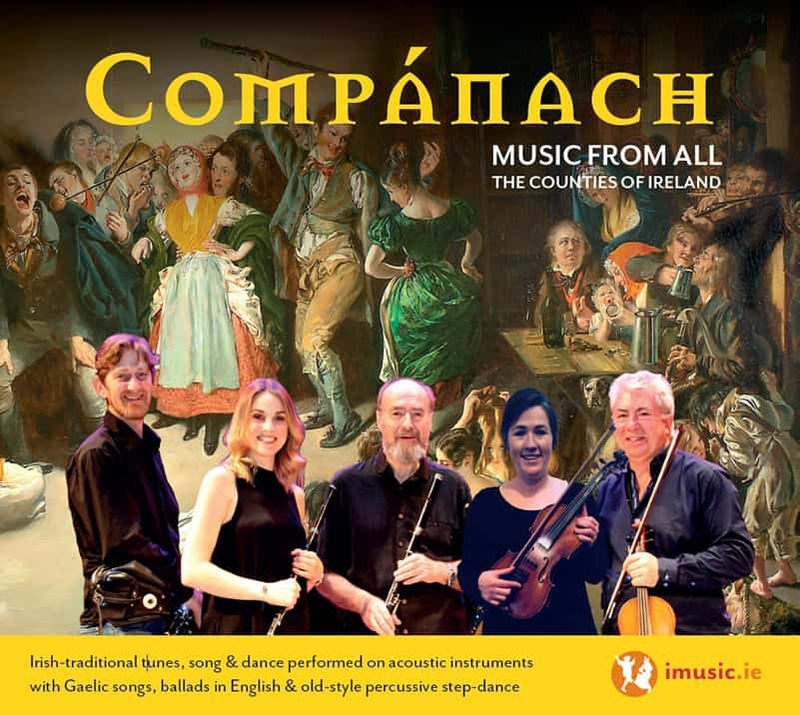 Compánach follows the A-Z route of the encyclopedia Companion to Irish Traditional Music. It goes alphabetically through the counties to create a musical gazetteer of the entire island of Ireland, showing that music-making has been a universal in all parts - not just in the perceived ‘big’ tourist-savvy regions such as Galway, Clare and Kerry which have a long-established experience of presenting local culture as an attraction for visitors. But those counties are, of course, deservedly well represented too, reflecting the scale of their present-day public respect for Traditional music. We divide the island in two, running in Disc 1 from Antrim to Fermanagh, and in Disc 2 from Galway to Wexford. Each one of the 32 counties of historic Ireland - covering Northern Ireland and the Republic - are visited in tunes. Several are indicated in songs, and the old-style step dance reflects pre-20th century practices in all counties and communities regardless of religion or politics. Yet all of this is just is a tiny sample of the still-tangible fruits of not only the last two centuries of music revival, but the previous millennium of artistic exploration in the music of Ireland. (01) Music c. 1832: music which is likely to have been played at the Snap Apple Night party in Bandon, 1832. This was held at the home of Fr. Matthew Horgan, an early antiquarian, one of those whose vision and commitment led to subsequent ‘National’ collections of historic artefacts, books and artwork, and indeed to the logic of the eventual revival, a century and a quarter later, of traditional music. These tunes were noted in Munster by a remarkable Protestant clergyman, James Goodman, who collected some 1100 song and dance tunes of pre-Famine music dating to the 1700s. Nos. 139, 133 & 140 from “the Goodman collection”: Tunes of the Munster Pipers [Vol. 1], ed. Hugh Shields; ITMA, Dublin, 1998]. 1/ Goodman 139, 2/ The Steamboat, 3/ An Staicín Eornan [barndances / hornpipes, 4/4]. (02) Antrim county: Top of the island, we play first a popular tune of the times, by Sligo harper Thomas Conalan (1640/1645 – 1698), published in 1796 (no. 12) by Edward Bunting, notated from a player who took part in the symbolic Belfast Harpers’ Assembly of 1792; this is followed by a reel from Francis O’Neill (629, 1907), a Loyal Belfast marching tune, and O’Neill jig which has clear old-Scottish overtones (154, 1907). 1/ ‘Molly St. George’ [paced air, 3/4], 2/ ‘The Belfast Lasses’ [reel, 4/4], 3/ ‘The Boys of Belfast’ [march, 4/4], 4/ ‘The Antrim Lasses’ [double jig, 6/8]. (03) Armagh county: An iconic song-air leads off, one of the melodies associated with a Fews aisling or vision poem, written by Art Mac Cumhaigh (1738-73) of Creggan (NW of Crossmaglen) it celebrates the deep cultural associations of the mountainous south of the county. This is followed by Gerry’s take on the McCusker Brothers’ local version of a popular céilí set dance, from Kilcreevy (N of Keady), close to where Tiarnán now lives. Gerry leads with one of Mullaghbane composer Josephine Keegan’s reels, and we conclude with another twentieth-century piece by Portadown/London fiddler player Brendan McGlinchey. 1/ ‘Úirchill a’ Chreagáin’ [song air], 2/ ‘The Sweets of May’ [set dance, double jig time, 4/4], 3/ ‘The Curlews’, & 4/ ‘Splendid Isolation’ [reels, 4/4]. (04) America: The most significant Irish emigration has been to the USA, peaking after the Great Famine. Persistence of Irish music there into the 1900s generated professionalism and a recording industry which fed back into early Irish radio after 1926 and into subsequent Traditional music revival in Ireland in the 1960s. First, a hornpipe, the title of which is throughly optimistic (O’Neill, 859), then a reel title which expresses the dream (513), a reel related to a centre of irish population (797), and one expressing longing for a partner who has left (586). 1/ ‘Off to California’ [hornpipe, 4/4], 2/ ‘The Green Fields of America’, 3/ ‘The Chicago’, & 4/ ‘My Love is in America’ [reels, 4/4]. (05) Ballad-song, in English: ‘The Shamrock Shore’, sung by Karan Casey. Keeping on the theme of the USA as a focal point for Irish economic and political migration, we move now to Ireland’s most popular song genre, the narrative ballad. This one is driven by anger about emigration, a political broadside assessing why people had to leave, and detailing how wrongs could be set right. (06) Carlow and Cavan counties: Carlow has many tunes, but this air, popularised in modern time when sung by Christy Moore, has lyrics, about events in the late 1500s. By Dublin Councillor PJ McCall (1861–1919), first secretary of the Dublin Literary Society, it was published in 1899 in Songs of Erinn; its melody shows how songs use dance melodies (it is similar to The Sweets of May). ‘Paddy Reilly’ is a famous sentimental lyric ballad which waltzed to, a popular song about a Cavan town NW of Virginia written by Co. Roscommon lyricist Percy French (1854-1920). The first reel is by Cootehill/Philadelphia fiddle player composer Ed Reavy, and the second is an iconic tune that has been claimed by Co. Sligo, but is a descendant, via the British military, of the 1700s, Scottish ‘Duke of Atholl’s Rant’. 1/ Follow me up to Carlow [song-air, 4/4 march], 2/ Come back Paddy Reilly to Ballyjamesduff, [popular song air, /3/4 old-time waltz]; 3/ The Hunter’s House, & 4/ Humours of Ballyconnell [reels, 4/4]. (07) Clare county: A classic double jig, also known as ‘Coppers and Brass’, from the county most associated with Traditional-music revival, this names a symbolic market town. The second jig is named for a famous West Clare piper and mentor; next is for a member of the famous Tulla Céilí band, followed by a tune from Barry’s era, the 1860s Goodman version of a celebration of Clare’s spectacular cliffs (Goodman 2, 956). We finish with a dark reel by the West Clare composer Martin ‘Junior’ Crehan, followed by the same tune in a higher key for the dance. 1/ Humours of Ennistymon, 2/ Garret Barry’s, & 3/ The Old Cliffs of Moher, [double jigs, 6/8]; 4/ The Otter’s Holt, [reel, in G, 4/4], 5/ Otter’s Holt [reel in D, 4/4]. (08) Cork county: First, a classic Munster air, its setting here matched to a West Cork song about the Sullane river (W of Macroom); the original, ‘Cailín Deas Crúite na mBó’, a song and hop-jig in 9/8 time, was put in print first by Bunting in 1796 (53) and Walker in 1818. It has been used for many lyrics, and (as reported by Irish-Australian Val Noone) was indeed the last song heard by outlaw Ned Kelly before his death in a siege in 1880. This is followed by O’Neill’s 1901 double jig (no. 8), popularised in another version by The Chieftains (Liscarroll is SW of Charleville). Next is a Gaeltacht-area, West Cork polka, then a reel named for the North Cork town famous for cheese and caves; and a composition by the TG4 Gradam awardee Ritchie Dwyer of Castletownbere. 1/ Banks of Sullane [song air, 9/8], 2/ Walls of Liscarroll [double jig, 6/8], 3/ The Ballyvourney Polka [2/4], 4/ The Maids of Mitchelstown, & 5/ The Fox on the town [reels, 4/4]. (09) Derry & Donegal counties: Co. Derry has a strong harp legacy flagged by this famous piece composed by harper Ruairí Dall Ó Cahtáin, a tune of reconciliation from the 17th-century. A melody in similar time, but different rhythm, the Mazurka, a form imported from Bohemia, follows, then moving to the Scottish, Strathspey-style ‘highland’ celebrating the mountains in the South of Donegal. Reels are next, first a big tune by the East Donegal fiddle player/composer Tommy Peoples, a member of Aos Dána, the Irish Arts-honours system (Glentown townland is W of St. Johnston), finishing on a high-energy, danced reel. (11) Down county: We open with another anthemic popular song, written by Cathal McGarvey (1866–1927) of Ramelton, County Donegal, words set to a much older air which is the ancestor of many tunes (as Belfast poet and flute-player Ciaran Carson says: “all tunes are descended from The Star of The County Down”). This is followed by a stridently assertive, anthemic Loyal march tune which also has a life as a Republican song; an O’Neill jig (83), then an East Down Lambeg drum and fife, march-style tune from Nigel Boullier’s collection Handed Down (p.96; Kilmood townland is NE of Ballynahinch); we finish on a reel for a scenic town on Strangford Loch. (12) Dublin county and England: The first tune is an old slip jig to which were added words by D.K. Gavan, ‘The Galway Poet’, for an English music-hall singer Harry Clifton (1824–1872), who popularised it; Luke Kelly revived it with The Dubliners in 1964. Tiarnan takes off in a reel named for the famous drink, into a Goodman piece (vol. 2, 783) which leads across to England, and exile prolific for dance music, with a tune made by Roscommon flute-player Josie McDermott, concluding on a classic reel in D.
1/ The Rocky road to Dublin [slip jig, 9/8]; 2/ Dublin Porter, 3/ Within a mile of Dublin, 4/ Trip to Birmingham, & 5/ The London Lasses [reels, 4/4]. (14) Fermanagh: The final piece on the first CD opens with Gerry on a great song air about an area W of Derrygonnelly, from fiddler Mick Hoy, words later sung by Gabriel McArdle and Rosie Stewart, followed by a Scottish-style tune similar to those in Donegal, popularised by Donegal-Tyrone fiddler Charlie O’Neill and the band Altan. Then jig-rhythm takes over, with a military-style tune from Cyril Maguire’s Hidden Fermanagh book (123), first published in Glasgow, 1875, and a jig from Pat Carty of Garrison, named for a bumpy road from Enniskillen to Belleek (Hidden Fermanagh, 81). 1/ Bessie of Rossinure Hill [song-air], 2/ The Fermanagh Highland [4/4]; 3/ The Fermanagh Quickstep, & 4/ The Maho Snaps [double jigs, 6/8]. (15) Galway county: We open this disc with the distinctive East Galway sound of a tremendous composer, Paddy Fahy of Kilconnell, followed by a pipes solo on the anthem of Galway Music. 1/ Paddy Fahy’s, & 2/ The Bucks of Oranmore [reels, 4/4]. (16) Kerry county: The polka is a form borrowed from Bohemia and European popular music in the later 1800s, and in its ‘single’ style here is now a hallmark tune-type in Munster, different in structure to polkas from further north. Music of the Kerry region, loosely referred to as “Sliabh Luachra” (the mountain where the rush plant thrives), the opening two tunes are named after famous players. The other big tune type locally is the “slide”, a single-jig, the first two here named after local areas, from Johnny O’Leary of Sliabh Luachra (Moylan 84 & 91; Brosna is S of Abbeyfeale, Co. Limerick; Kilcummin is a parish W of Killarney). The final one, Seán Ó Riada’s version of the Kilcummin, celebrates a famous West Kerry village. (17) Kilkenny, Kildare, Laois & Longford counties: a local hop jig opens the set, named for the premier county in the unique Irish sport of hurling. It is followed by a typical Irish jig which marks the frivolity of the horse-racing class of Kildare, then a Co. Laois multi-part reel and another from neighbouring Longford. 1/ High Road to Kilkenny [hop jig, 9/8], 2/The Rakes of Kildare, [double jig, 6/8]; 3/ The Trip to Durrow, & 4/The Longford Weaver [reels, 4/4]. (18) Local place and love: Young Kate of Glenkeen expounds on the beauty of a loved one by comparison with the exuberance of nature in famed beauty spots; a song from Sam Henry’s Songs of the People (1990, p. 232), sung by Maurice Leyden. (19) Louth, Leitrim & Limerick counties: The first melody relates to a local hill (now Killen Hill, NW of Dundalk), a site of megalithic significance in Louth mythology and history, where a harp and poetry school flourished in the late 1600s. The tune is by Peadar Ó Dúbhda (1907), used as the air for the poem of the same title, a lyric by Louth hedge-schoolmaster harper-poet Peadar Ó Doirnín (c. 1700-1769). A reel from the south of the county follows, then harper Turlough Carolan’s commemorative melody for the 16th-century Leitrim chieftain, O’Rourke of Breffni, a tune that recalls an annual feast at Dromahair Castle. A hop jig honouring the yellow whin (furze) bushes which are a colourful sight on the county’s classic ‘drumlin’ hills follows, and a more rollocking jig named for the town of Limerick follows. 1/ Úrchnoc Chéin Mhic Cáinte [song-air], 2/ The Drogheda Lasses [reel, 4/4]; 3/ O’Rourke’s Feast [harp tune, 6/8 & 3/4]; 3/ The Whinny Hills of Leitrim, & 4/ Kitty Come Down to Limerick [hop jigs, 9/8]. (20) Love song: Dobbin’s Flowery Vale, sung by Stephanie Makem. A 19th century song about love, set in the pleasant landscape of a public path along the Ballinahone river in Armagh. By a shoemaker named McGowan, it has come via the singing of Stephanie’s great grandmother, Sarah Makem. (21) Mayo county: the pipes leads with a tune of apology addressed to the tenant of a British aristocratic seat in that county, composed by 1700s harper Dáithi Ó Murchadha. It is followed by a jig, the title of which marks a rout of British troops by Irish and French near Castlebar in August, 1798, and the set is wrapped up by a tumbling reel more representative of the plain people for whom dancing was a popular pursuit (No. 75 from Breathnach’s CRÉ 1), also called ‘Sweet Biddy of Ballyvourney’ by O’Neill (566). (22) Meath, Monaghan & Offaly counties: jigs open, the first, also known by the evocative title The Rolling Wave, named for Meath’s county town Trim which has a fabulous castle ruin. Monaghan is a border county and town, represented here by the customary four-part, eponymous tune (O’Neill, 245, has three parts to it). The third jig, better-known as Banish Misfortune, has three versions in O’Neill (53, 106, 150). We finish with another O’Neill place-named piece (770) the music of a town celebrated in a 2000 book by Thomas Wall. 1/ The Humours of Trim, 2/ The Monaghan Jig, & 3/ The Humours of Mullanafawnia (NE of Birr, Co. Offaly) [double jigs, 6/8]; 4/ The Edenderry Reel, [4/4]. (23) Place-praise song: A Chomaraigh Aoibhinn Ó, extolling the virtues of the Comeragh mountains range, sung here by Karan Casey. (24) Roscommon & Sligo counties, Step-dance: Boyle is the county capital of Co. Roscommon, neighbour to Co. Sligo which has strong links to the early-1900s New York Irish music scene. The earliest gramophone recordings came out of this, notably those by James Morrison and Michael Coleman (Co. Sligo), rendering them an important style resource in the revival of Irish Traditional music after the 1950s. Lissadell, NW of Sligo town, is a townland associated with the poet WB Yeats, and this first reel is seen as the work of Co. Mayo composer John McGrath who lived among Sligo musicians in New York. Martin Wynne, who emigrated to New York also, is another fiddler made famous through the next tune, and a county town and sea bay are celebrated by the final piece. 1/ The Plains of Boyle [hornpipe, 4/4], 2/ The Humours of Lissadell, 3/ Martin Wynne’s, & 4/ The Boys of Ballysodare [reels, 4/4]. (25) Sean-nós song: An Sceilpín Draighneach, from the singing of Darach Ó Catháin, a passionate song about unrequited love with the Connemara hallmark, wide in range, and rich in melismatic decoration, sung by Róisín Chambers. (26) Tipperary county: Music from two of the most famous Irish tune-smiths, first Sean Ryan, celebrating the castle at Cashel; second Paddy O’Brien - who is famed as a pioneer accordion stylist - with a tribute to friends from up near Longford; the third is a classic, strong tune named after the county itself. 1/ The Castle, 2/ The Boys of Lough Gowna, & 3/ Old Tipperary [double jigs, 6/8]. (27) Travel song: Sweet Omagh Town. Sung by Roisín White, a terrific 19th century spin of wild creativity which takes the rake on an imaginative peregrination all over Ulster and to the two major emigration centres. But so content is he with his lot that not even heaven in the next life can be imagined to be as satisfying as the home place. (28) Tyrone county: The air is most associated with a song on a 1600s Tyrone rapparee (rebel) during Cromwellian times in Ireland, named for the mountain range south of Dungannon. We pick up on a march from Omagh, by composer, songwriter and fiddle player Arthur Kearney (1921-2004), composed in 1961 for the centenary of the opening of a school in the county town by the teaching order the Christian Brothers. We finish with a reel celebrating the young women of the townland Tirnaskea, E of Pomeroy. Close to The Rock, it is a place with historic, and continuing, association with music. The tune was collected for The Northern Fiddler (p. 241) from Peter Turbit of Ballygawley. 1/ Mountains of Pomeroy [song-air], 2/ The Centenary March [4/4], 3/ The Tirnaskea Lasses [reel, 4/4]. (29) Waterford, Westmeath & Wicklow counties: in keeping with the dancing image in the Maclise painting we revert to jigs, the first from Co. Waterford which celebrates the young women of the town of Tramore, next the wild men and drinkers of Westmeath, and the final one a popular 19th century tune which marks place and industry in homage to Wicklow’s subterranean economy. (30) Wexford county & Slán/Farewell: This farewell set opens on two anthemic song-airs from the bottom of the island, the first by Robert Dwyer Joyce (lyrics) and Arthur Darley (melody), the second by PJ McCall, from the centenary commemoration period of the 1798 rising. Killane is in Co. Carlow, but the hero John Kelly’s renown was in New Ross where he was hanged and decapitated. We finish with a reel named for a county town, and conclude the programme with a farewell tune (‘slán’ is ‘goodbye’) to all of the island of Ireland. 1/ The Boys of Wexford, 2/ Kelly the Boy from Killane [marches]; 3/ Pretty Girls of Gorey, & 4/ Slán le hÉirinn [reels, 4/4]. Gerry O’Connor is a Dundalk fiddle player, a versatile figure in Irish music who is solidly ‘of his place’ in the music’s traditions. He has toured Ireland and Europe solo, with the bands Skylark and Oirialla and with Breton guitarist Giles Le Bigot. He plays also in the USA and Canada, and has many recordings, among them the seminal albums of Lá Lugh with Eithne Ní Uallacháin (Bilingua, 2016). His solo albums are Journeyman (2003) and Last Night’s Joy (2018), and he teaches fiddle internationally. Tiarnán Ó Duinnchinn is an award winning Uilleann Piper from Monaghan who began playing uilleann pipes at the age of nine with The Armagh Pipers Club. Holder of four Fleadh Ceoil All-Ireland titles and two Oireachtas titles he has toured widely in Europe and has recorded widely, both solo (Reggish Paddy, 2017) and with Máire Ní Bhraonáin of Clannad, Stephanie Makem and harper Laoise Kelly (Ar Lorg na Laochra, 2016). Fintan Vallely is a flute player and is director of Compánach and editor of Companion to Irish Traditional Music. From Armagh, he has performed and taught throughout the world, was a critic and lectured for many years on Traditional music. He has written and edited several books, and has recorded solo (Merrijig Creek, 2018) and with singer Tim Lyons and guitarist Mark Simos (The Starry Lane to Monaghan, 1992). Sibéal Davitt is a sean-nós dancer with a deep knowledge of ballet, jazz and contemporary since the age of five. She has achieved numerous awards including TG4’s ‘Glas Vegas’, and has performed nationally and internationally at such as Electric Picnic and Celtic Connections, and with bands such as The Chieftains. A student of film, she has produced shorts on dance; she teaches sean-nós, and creates and performs collaborations of Irish traditional and contemporary dance. Karan Casey is a Co. Waterford singer who learned both local Traditional and Classical repertoires and techniques, and had a particular interest in Jazz. While studying this in New York she sang with the band Atlantic Bridge, then became a founder member of Solas in 1994, subsequently performing solo and recording and touring with concertina player and composer Niall Vallely. She has numerous solo and other recordings, bookended by Songlines (1997) and Two More Hours (2014). Máire Ní Choilm is a Gaoth Dobhair, Co. Donegal singer in Gaelic. Her distinctive voice and interpretation of local songs have gained her National awards at An tOireachtas, the Fleadh Cheoil and the Pan Celtic Festival. She has performed at Celtic Connections and Festival Interceltique de Lorient, and recorded Nuair a théid sé fán chroí in 2010. Stéphanie Makem is the great-granddaughter of the celebrated Ulster folksinger Sarah Makem and grand-niece of ballad singer Tommy Makem. She sings a South East Ulster repertoire in English and Gaelic which includes many of Sarah’s songs, and recorded on Ceol is Píob with Tiarnán Ó Duinnchinn in 2008. Róisín White is a singer from the Mourne Mountains in south County Down who learned from her mother in an environment of Irish language, song and story. Influenced in later years by Joe Holmes, Len Graham and Sarah Anne O’Neill, she went on to record a solo alum The First of My Rambles in 2001, has been a guest and tutor at song festivals in Ireland and Britain, and was awarded the TG4 Gradam Amhránaí in 2015. Maurice Leyden is a Belfast based folk-song collector, singer and broadcaster specialising in Ulster folk-song. He has written on urban traditional songs in his book Belfast, City of Song, and on children’s singing games in Ireland in ‘Boys and Girls Come out to Play’, and is recorded on The Tern and the Swallow. A lecturer on song too, he has performed in Britain, Europe, America and Canada, and teaches Ulster singing style with Belfast Trad.